Updated at 6:27 p.m. ET: Police have identified 36-year-old Bradford Baument as the gunman who stormed a Florida hair salon, fatally shooting three women and injuring a fourth before killing himself at a friend’s home, police said. Police say the deadly rampage appeared to part of a domestic dispute. The Salon’s manager, Marcia Santiago, who was also Baument’s ex-girlfriend, had filed a restraining order against Baument, according to WESH-TV in Orlando. About two hours before a court hearing on the restraining order was to start, Baument stormed Las Dominicanas M & M Salon in Casselberry, northeast of Orlando, and opened fire, police spokeswoman Sara Brady said. Santiago was critically injured in the shooting. 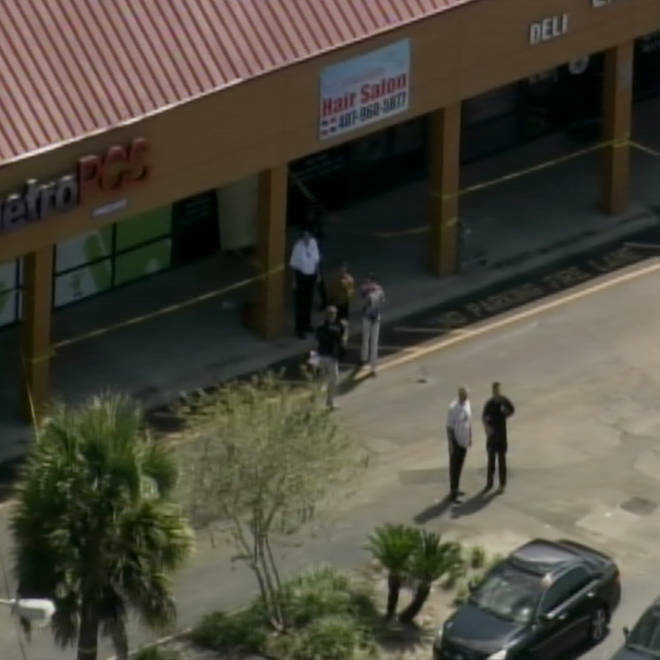 Officials identified two of the slain as: Noelia Gonzalez-Brito, 28, an employee, and Gladys Cabrera, 52, a customer. Identity of the third slaying victim was not released. Two others escaped injury by hiding in the bathroom, WESH-TV reported. After the shooting, the gunman traveled about seven miles to a friend's home in Winter Park and shot himself, said Seminole County Sheriff's Office spokeswoman Heather Smith. He did not threaten his friends. "He advised them he was having some problems and that they were problems he could not remedy and he proceeded to take his life with a firearm inside the home," Smith told WESH-TV. About two dozen mourners gathered near the salon, located in a strip mall just , and police taped off the parking lot. Yellow paper covered the salon's windows. A Dominican Republic flag was hung in the storefront along with a neon sign that read: Hair Cut. Color. Perm. A witness to the salon shooting told the Orlando Sentinel he heard gunshots before seeing the gunman flee. "We saw the guy with the gun in his hand ... coming this way ... on foot with the gun in his hand," said Juan Diaz, who was at a nearby store at the time of the shooting. He said he went into the salon once the gunman left and saw "a bunch of dead bodies." A year ago in Southern California, an angry ex-husband donned a bulletproof vest before killing his ex-wife and six of her fellow stylists and patrons at a hair salon, police said. Scott Dekraai is also accused of killing a man in the parking lot. He is awaiting trial on murder charges. Some chimps to be removed from federal research, but where will they go? Video: How dangerous was NYC bomb plot suspect?